Why is it that most spouses say their wives or husbands don’t listen? Why do employees consistently complain about the failure of their bosses to listen? Do people not care about listening, or is there something fundamentally wrong with the way we listen? 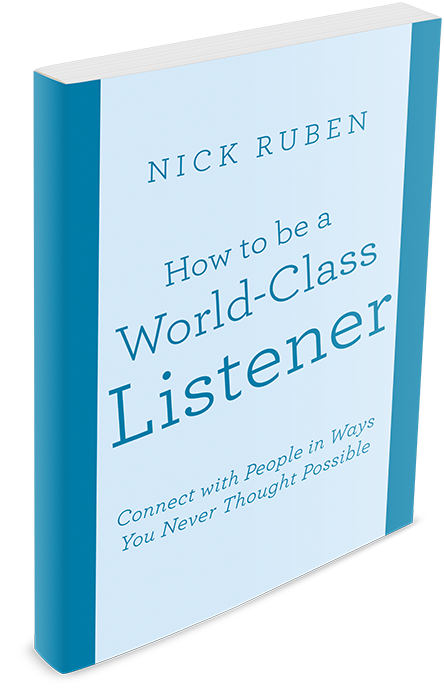 Author Nick Ruben reveals How to be a World-Class Listener. How to enjoy a more intimate relationship with your significant other, better interactions at work, and stronger connections with those you care about by developing listening skills. Fill in the form below to receive the first five chapters free and discover the three beliefs which make effective listening impossible. Copyright © 2016. Nick Ruben. All rights reserved.